Some days, I find myself craving matcha. Does that ever happen to you? I crave the chawan in my hands, the powder on my fingers, the swoosh of the chasen, the pattern of tiny bubbles on the surface and the aromas and texture and flavor. It’s irresistible. 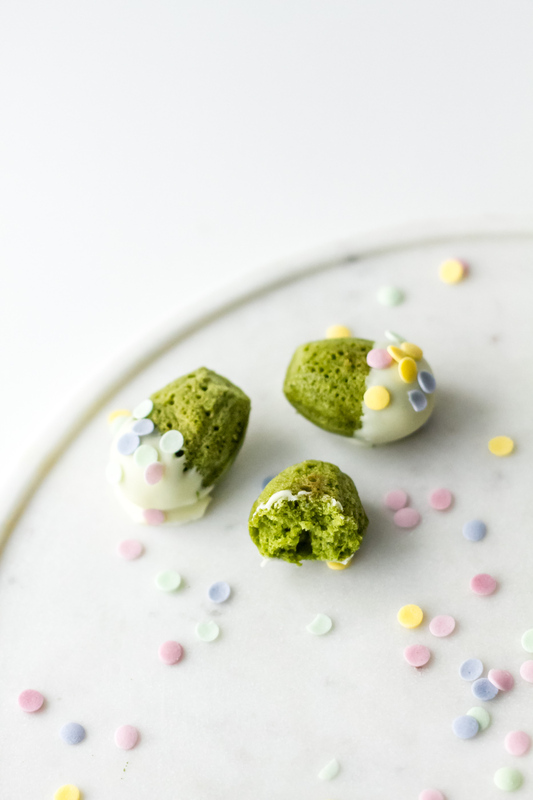 Some other days, I crave whatever edible and colorful pops up on my Instagram feed and that’s exactly what happened when my sister Chiara made her matcha madeleines dipped in white chocolate and those popped up on my feed… they’ve been on my mind ever since! Let me start by saying that my matcha madeleines are nowhere near as perfect-looking as my sister’s (she’s the talented baker in the family), but they are incredibly delicious and their texture is just a dream. The tiny air bubbles in the batter (somehow) didn’t disappear while baking but I’m not mad, because they match the bubbles on the surface of my matcha. I don’t know for sure, but refrigerating the batter overnight (like my sister suggests in her recipe) might have contributed to the bubbly effect on the surface of my madeleines. Sis, was that a trap? Anyway, as you might have guessed, these pretty confections are best enjoyed with a bowl of matcha for a moment of pure bliss. In a bowl sift together flour, matcha and baking powder. Set aside. In the bowl of a standing mixer fitted with the balloon whisk, whisk eggs, sugar, salt and vanilla extract until pale and fluffy. Add the dry ingredients and stir thoroughly with a spatula. Slowly add the butter and mix well. Cover the bowl and refrigerate for at least an hour. Preheat the oven to 350 F (180 C). I have a silicone mold and I greased it a little to be on the safe side. Fill the mold but try not to overfill to keep a clean, crisp shape and edge. Bake 10 minutes. Do not over bake otherwise they will be dry. Once they have cooled, melt the chocolate chips in a double boiler or in the microwave. Dip each madeleine in the chocolate, decorate with sprinkles if you wish and put them on a parchment paper lined plate. Let set in the fridge for 15 minutes or longer. Dust with matcha before serving. 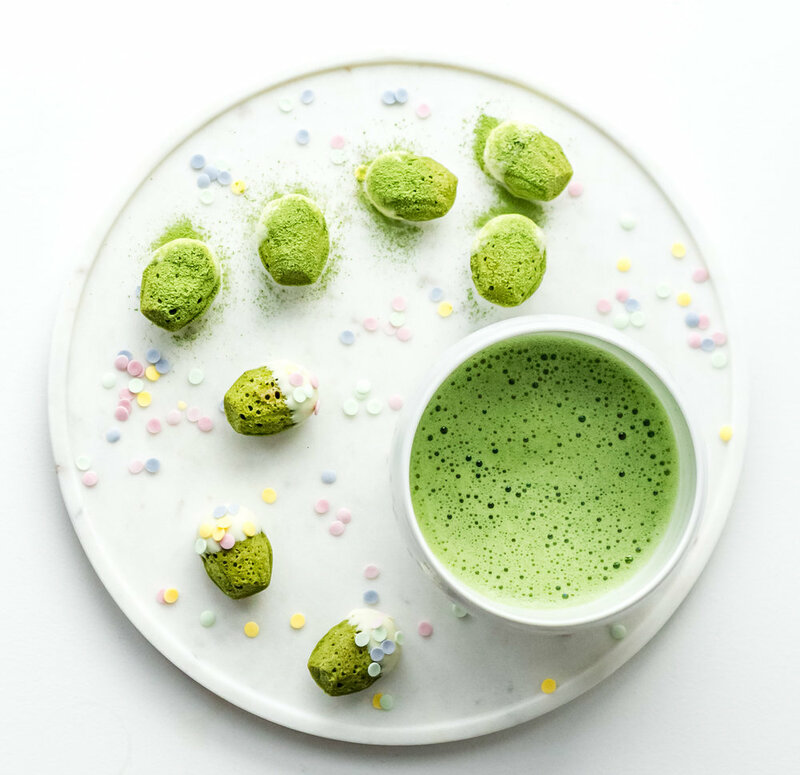 Have you ever had matcha madeleines?